"I would like some Ideas on fast growing plants or ivies to grow for indoor topiaries." A topiary is a vining or creeping plant, or group of plants that are shaped and trimmed to create a 3 dimensional object, based on a frame that the plant grows around. Topiary Frames can be purchased at many hobby stores and larger nurseries. The plant(s) are periodically trimmed to conform to the shape of the frame. Normally, the topiary frames are filled with sphagnum moss on which the plants will grow. Individual plants are removed from their pots and the root ball is simply enbedded into the sphagnum moss. A little care and understanding of the maintenance will enhance the appearance of the sculpture and ensure years of enjoyment from your topiary. Direct sunlight will bleach out the moss to a golden tan color, however green colorant can be used to retain the original hue. The sphagnum moss itself prefers to be kept damp at all times. As the plants grow, simply attach the runners to the frame using plastic florist tape or twist ties, until the sculpture is covered to your satisfaction. If your sculpture begins to look a little shaggy, you can simply use scissors to give it a little trim. 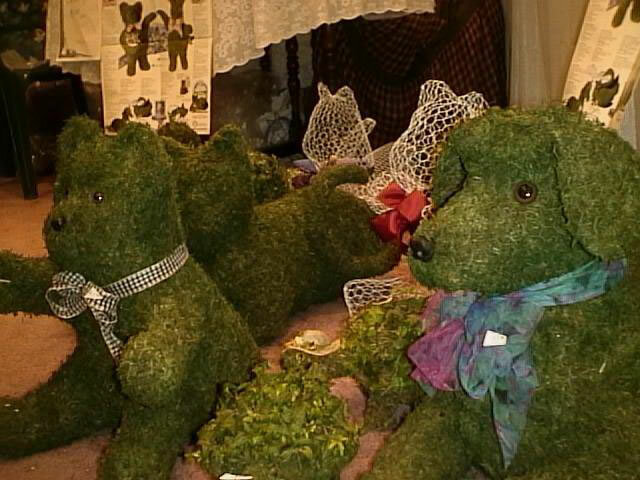 There are dozens of plants that can be clipped and shaped into topiary forms. Most any vining or creeping type plant can be used successfully. Many herbs can be used for your topiary, such as Rosemary, French Lavender, Scented Geranium, and lemon eucalyptus. The plants you choose will depend on the topiary shapes you want to create, so personally, I would just wander through the house plants section of your favorite nursery and see what you like.